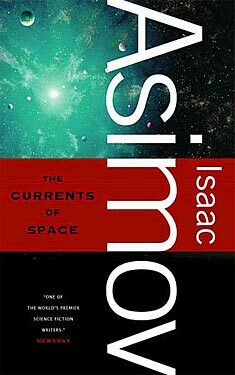 If you liked The Currents of Space you might like these books. Rik put down his feeder and jumped to his feet. He was trembling so hard he had to lean against the bare milk- white wall. They looked at him and the gritty mumble of men at lunch died somewhat. Eyes met his out of faces indifferently clean and indifferently shaven, glistening and white in the imperfect wall illumination. The eyes reflected no great interest, merely the reflex attention enforced by any sudden and unexpected cry. Rik cried again, "I remember my job. I had a job!" Someone called, "Shoddop! "and someone else yelled, "Siddown!" The faces turned away, the mumble rose again. Rik stared blankly along the table. He heard the remark, "Crazy Rik,"and a shrug of shoulders. He saw a finger spiral at a man's temple. It all meant nothing to him. None of it reached his mind. Slowly he sat down. Again he clutched his feeder, a spoon-like affair, with sharp edges and little tines projecting from the front curve of the bowl, which could therefore with equal clumsiness cut, scoop and impale. It was enough for a mill-worker. He turned it over and stared without seeing at his number on the back of the handle. He didn't have to see it. He knew it by heart. All the others had registration numbers, just as he had, but the others had names also. He didn't. They called him Rik because it meant something like "moron"in the slang of the kyrt mills. And often enough they called him "Crazy Rik." But perhaps he would be remembering more and more now. This was the first time since he had come to the mill that he had remembered anything at all from before the beginning. If he thought hard! If he thought with all his mind! All at once he wasn't hungry; he wasn't the least hungry. With a sudden gesture, he thrust his feeder into the jellied briquet of meat and vegetables before him, pushed the food away, and buried his eyes in the heels of his palms. His fingers thrust and clutched at his hair and painstakingly he tried to follow his mind into the pitch from which it had extracted a single item—one muddy, undecipherable item. Then he burst into tears, just as the clanging bell announced the end of his lunch shift. Valona March fell in beside him when he left the mill that evening. He was scarcely conscious of her at first, at least as an individual. It was only that he heard his footsteps matched. He stopped and looked at her. Her hair was something between blonde and brown. She wore it in two thick plaits that she clamped together with little magnetized green- stoned pins. They were very cheap pins and had a faded look about them. She wore the simple cotton dress which was all that was needed in that mild climate, just as Rik himself needed only an open, sleeveless shirt and cotton slacks. She said, "I heard something went wrong lunchtime." She spoke in the sharp, peasant accents one would expect. Rik's own language was full of flat vowels and had a nasal touch. They laughed at him because of it and imitated his way of speaking, but Valona would tell him that that was only their own ignorance. Rik mumbled, "Nothing's wrong, Lona." She persisted. "I heard you said you remembered something. Is that right, Rik?" She called him Rik too. There wasn't anything else to call him. He couldn't remember his real name. He had tried desperately enough. Valona had tried with him. One day she had obtained a torn city directory somehow and had read all the first names to him. None had seemed more familiar than any other. He looked her full in the face and said, "I'll have to quit the mill." Valona frowned. Her round, broad face with its flat, high cheekbones was troubled. "I don't think you can. It wouldn't be right." "I've got to find out more about myself." Valona licked her lips. "I don't think you should." Rik turned away. He knew her concern to be sincere. She had obtained the mill job for him in the first place. He had had no experience with mill machinery. Or perhaps he had, but just didn't remember. In any case, Lona had insisted that he was too small for manual labor and they had agreed to give him technical training without charge. Before that, in the nightmarish days when he could scarcely make sounds and when he didn't know what food was for, she had watched him and fed him. She had kept him alive. He said, "I've got to." "Is it the headaches again, Rik?" "No. I really remember something. I remember what my job was before——Before!" He wasn't sure he wanted to tell her. He looked away. The warm, pleasant sun was at least two hours above the horizon. The monotonous rows of workers' cubicles that stretched out and round the mills were tiresome to look at, but Rik knew that as soon as they topped the rise the field would lie before them in all the beauty of crimson and gold. He liked to look at the fields. From the very first the sight had soothed and pleased him. Even before he knew that the colors were crimson and gold, before he knew that there were such things as colors, before he could express his plea sure in anything more than a soft gurgle, the headaches would flicker away faster in the fields. In those days Valona would borrow a diamagnetic scooter and take him out of the village every idle-day. They would skim along, a foot above the road, gliding on the cushioned smoothness of the counter- gravity field, until they were miles and miles away from any human habitation and there would be left only the wind against his face, fragrant with the kyrt blossoms. They would sit beside the road then, surrounded by color and scent, and between them share a food briquet, while the sun glowed down upon them until it was time to return again. Rik was stirred by the memory. He said, "Let's go to the fields, Lona." She fumbled at the thin money pouch she kept between herself and the soft blue leather belt she wore, the only luxury of dress she allowed herself. Rik caught her arm. "Let's walk." They left the highway for the winding, dustless, packed- sand roads half an hour later. There was a heavy silence between them and Valona felt a familiar fear clutching at her. She had no words to express her feelings for him, so she had never tried. What if he should leave her? He was a little fellow, no taller than herself and weighing somewhat less, in fact. He was still like a helpless child in many ways. But before they had turned his mind off he must have been an educated man. A very important educated man. Valona had never had any education besides reading and writing and enough trade- school technology to be able to handle mill machinery, but she knew enough to know that all people were not so limited. There was the Townman, of course, whose great knowledge was so helpful to all of them. Occasionally Squires came on inspection tours. She had never seen them close up but once, on a holiday, she had visited the City and seen a group of incredibly gorgeous creatures at a distance. Occasionally the mill-workers were allowed to listen to what educated people sounded like. They spoke differently, more fluently, with longer words and softer tones. Rik talked like that more and more as his memory improved. She had been frightened at his first words. They came so suddenly after long whimpering over a headache. They were pronounced queerly. When she tried to correct him he wouldn't change. Even then she had been afraid that he might remember too much and then leave her. She was only Valona March. They called her Big Lona. She had never married. She never would. A large, big- footed girl with work- reddened hands like herself could never marry. She had never been able to do more than look at the boys with dumb resentment when they ignored her at the idle- day dinner festivals. She was too big to giggle and smirk at them. "It's your turn next, Lona." "When will you have a baby, Lona?" She could only turn away. But when Rik had come, he was like a baby. He had to be fed and taken care of, brought out into the sun, soothed to sleep when the headaches racked him. The children would run after her, laughing. They would yell, "Lona's got a boy friend. Big Lona's got a crazy boy friend. Lona's boy friend is a rik."